If you are not very keen on synthetic foam mattresses but would prefer something more natural, then you will be interested to know that Zenhaven mattress is made of 100% natural latex. It provides a natural feel and more responsiveness than memory foam mattresses. Zenhaven mattresses are made of Talalay latex, which is more resilient and has a supple and buoyant feel about it. It has two sides – firm and soft plush, any of which can be chosen by just flipping the mattress. It also offers several health benefits. It is hypoallergenic and contains no harmful chemicals that might release vapors injurious to health like the ones released by chemical-based bed foams. Its unique feel gives your body the right support and comfort that is necessary for a restful sleep. 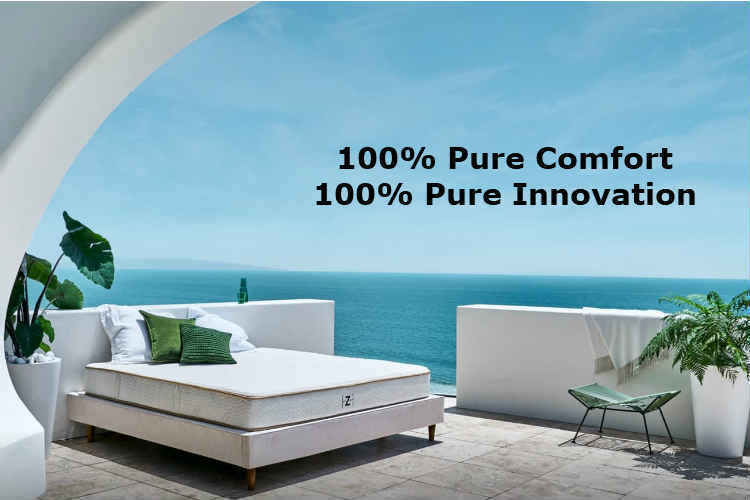 The Zenhaven mattresses are built on the philosophy – 100% Pure Comfort, 100% Pure Innovation. The mattress is made out of pure latex tapped from the trees. The 2-in-1 innovative surfaces provide two firmness options to choose from so that you can have the most comfortable sleep experience. Here is a look at the outstanding features of Zenhaven Mattress. The firm and soft sides can be chosen by just flipping over the mattress. Unlike other foam mattresses, it is not compressed for delivery. Fully manufactured in the U.S.A. The Zenhaven mattress has two firmness options, Soft Plush and Gentle Firm, any of which can be chosen by just flipping the mattress. The mattress is 10-inch thick and here is more information on the layers that makes up the mattress. We will start from the top layer of the Luxury Plush side and go to the bottom layer which forms the Gentle Firm side. The top cover is made of quilted organic cotton to give a natural feel to the body. The material is made without bleaching agents which uses harmful chemicals and is hand-stitched for the luxurious look. The first layer below the cover is 1 inch thick. This is made of 100 % organic wool from New Zealand. This material is flame retardant for added safety. This is also breathable and reduces moisture. The second layer is the 1.5 inches thick Comfort Layer. The “5-Zone Comfort Layer” has 5 different sections with different sizes of pinholes. The different sections result in better spinal alignment and comfort. The thigh and shoulder region is meant to give better body weight distribution. The third layer is 3-inches thick. This is the core layer. It is made of Talalay latex that forms the Plush base layer for the Soft Plush side. This layer provides more soft comfort. The fourth layer is 3-inches thick and is also made of Talalay latex and forms the base of the Gentle Firm side. This layer is firmer than the one above it. This layer provides firmer support when the mattress is flipped over. This is the same 1.5-inch thick layer of Talalay latex that is on the first or the top comfort layer, but it is made more firm than the Soft Plush side. The Talalay latex used in the mattress goes through a process that produces very consistent latex. It is made in varying densities with a wide range of firmness levels. Unlike foam mattresses, it stays firm and is not easily compressible. This helps in providing the best edge support. You can sit around the edges comfortably without sinking in the bed. 20-year long warranty – Zenhaven gives you one of the longest warranty periods among mattresses. Money back guarantee – If for any reason you are not satisfied with the mattress, you get your money back. 120-nights trial – Try out the Zenhaven mattress for 120 nights without any obligation. Packaging – The mattresses are not compressed for shipping, but is shipped in its ready-to-be installed form. Free shipping – The mattress is shipped free within the US. Zenhaven is presented by the well-known Saatva brands which have a long history in the bedding and mattress industry. Zenhaven is made with American Talalay latex, and the process involves transforming the latex from liquid to solid state. This process produces extremely consistent material that has larger cells and is more breathable. Here are some more standout features. You get two different comfort level – Luxury Plush and Gentle Firm, in a single mattress. The Luxury Plush side is chosen by 80% of customers who look for effortless support to the body. The Gentle Firm side for those looking for a firmer fell, as it is 18% firmer than the other surface. Pure American Talalay latex resists molds and microbes. It is also more durable and has a long life. It is a natural product which makes it hypoallergenic. During the talalay process, pinholes are made within the material. The size and distribution of these pinholes can be varied to change the density. There are 5 zones to give the torso and shoulders more support and adequate spinal alignment. Instead of expecting to sink on the mattress, Zenhaven gives you the feeling of being lifted and a floating experience. It provides excellent pressure-relief. On the top of the mattress is an ultra-comfortable layer made out of 100% organic wool imported from New Zealand. It is wrapped in an organic cotton cover. The open cell structure enables easy circulation of air and helps to dissipate body heat. The premium tatalay latex is seven times more breathable than ordinary latex. The Zenhaven mattress has two comfort levels, which makes it suitable for all type of sleepers. The back-sleepers and side-sleepers will find the Soft Plush side offering all the support and comfort they require for a peaceful sleep. The stomach-sleepers can flip over the mattress to get the Gentle Firm side on top. This will help distribute the weight on other parts of their body like torso, shoulders, and thighs. The stomach will not sink in the mattress, and this will relieve the pressure. All users have reported unmatched comfort. Zenhaven’s Talalay latex also offers a range of health benefits. It’s naturally hypoallergenic and resistant to mold, microbes, and dust mites. Its unique resilient feel elevates and conforms to your body shape. You get perfect support, total comfort, and a truly restorative night’s sleep. The Zenhaven mattresses are 10-inches thick and come in all six popular sizes. Take a look at the sizes here. The Zenhaven mattresses are definitely more expensive. But this is because they use the best quality premium material and not just any cheap substitute. They are great value for the money spent as they are so durable and last for years. There are a few cons of Zenhaven mattresses. 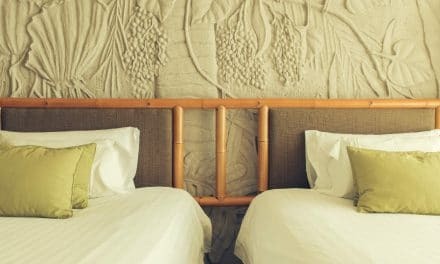 These are not substantial, but a buyer should be aware of these before making that final decision to buy this mattress. There is no denying that Zenhaven mattresses are more expensive than their cheaper latex counterparts in the market. But then you must remember that you are buying a premium mattress that uses high-quality materials. Unlike foam mattresses which are compressed for transportation, Zenhaven comes in fully expanded form. So it may require some effort to carry it to your bedroom when it gets delivered to you. The foam mattresses may be doubled over and shifted around easily, However, a premium latex mattress like Zenhaven needs to be carefully shifted from one room to another. If you want the natural feel of natural latex and do not prefer the spring or foam mattresses, then Zenhaven is just right for you. Made with Talalay latex it has built-in pin-holes that are spaced apart to give specific density to give proper support to different parts of the body. It is quite durable and will last for a generation. This confidence is expressed in its long warranty of 20 years. 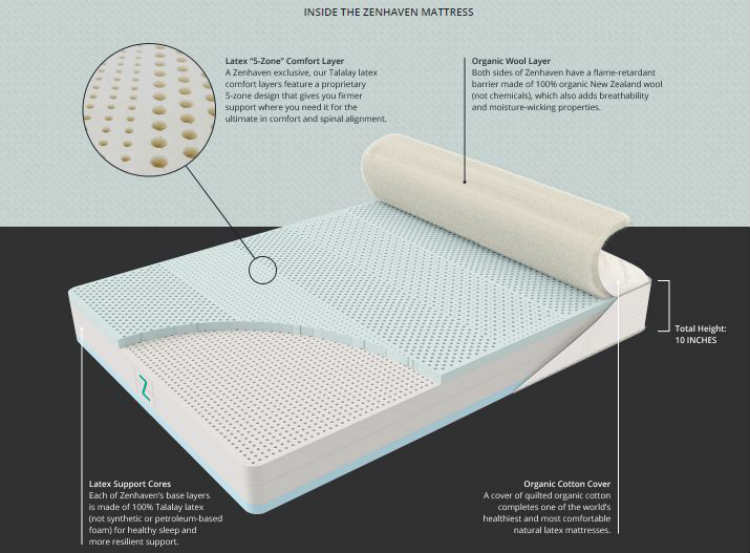 Zenhaven has got two firmness options in one mattress. So if you prefer a firm support you need to just flip the mattress over. This assures that no matter whether you are a back, side or stomach sleeper, there is something that provides all the comfort you need. You can try it during the 120-nights trial which will not cost you anything. But make no mistake, you will love the amazing comfort and healthy feel of the mattress. Zenhaven is a healthy hypoallergenic mattress that is made of natural latex and makes for a very sensible choice. NextAre You on a Right Track to Lose Weight? Quiz it Out?